To get your free ticket, you must come to the ticket table at the concert and present your current Sonoma State University student ID. These tickets are only available between 7pm and 7:30pm and are distributed on a first-come, first-served basis. One ticket per valid ID. Sonoma Bach's resident vocal consort teams up with the Green Mountain Singers to perform a cappella music in the stunning sanctuary of St. Seraphim of Sarov Orthodox Church. 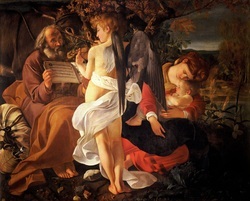 Featuring the music of Josquin Desprez, Giovanni Pierluigi da Palestrina, and Orlande de Lassus, this site-specific concert juxtaposes Renaissance and early Baroque settings of angelic texts for two to eight voices with the spectacular frescoes of angels in the church. Please note that there is a mistake on the ticket order panel of our season brochure. The concert is indeed on SATURDAY, APRIL 18.